This may sound unbelievable, but I can show you how this is done. First you will need to know what a ‘pre-enrollee’ is. A pre-enrollee is a home business lead that has been qualified by a questionnaire or another qualifying method. They have shown interest in learning about a business opportunity and their responses indicate which home business they would be a lead for. The lead profile of the pre-enrollee is matched to a business that suits their needs and if that is your company they are directed to your website. The lead is considered a pre-enrollee once they have provided your website with their contact information to state that they are interested in learning about your home business opportunity. This method brings MLM leads directly to your website so they can get information about the opportunity they are about to join. The lead information for the pre-enrollee is immediately delivered to you so you can contact them to make the offer personally if you wish. If you would prefer not to call the pre-enrollee you can have an enrollment page with suitable copy to promote your opportunity. From there your home business lead can decide to enroll, or not, and you didn’t even have to pick up the phone. It’s like business growth on autopilot! The greatest advantage of this system is that your network marketing leads have always qualified themselves. If they were not interested in your home business opportunity they would not have taken the steps to sign up. This means that contacting them to determine what their immediate needs are, and explaining how your home based business opportunity can help with their needs can be critical. As mentioned above, you can acquire leads automatically without having to contact anyone. However you should know that the difference in turn around can be as much as 10% when you call your MLM lead while they are still browsing your website. As with any form of leads that you buy from a lead generation service you will want to ensure that your pre-enrollee leads are quality leads. Make sure that you deal with a company that does not offer incentives to people just for requesting information. 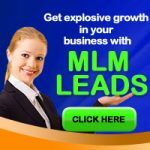 You should also look for a lead guarantee when you are looking for a company to purchase your MLM leads from. It just doesn’t make sense to pay for traffic being directed to your site that has not been converted into a pre-enrollee lead. Pre-enrollee MLM leads are considered by some to be the highest quality home business lead you can buy. These people who are interested in building a home based business and have qualified themselves to be looking for an opportunity like yours. It just doesn’t get any better than that.